Meditation, once practiced mostly by those searching for spiritual enlightenment, has become part of the mainstream medical establishment. No less an authority than the Mayo Clinic recommends meditation for those who suffer from a wide range of conditions, from allergies to sleep problems to cancer. Mediation is helpful because it can reduce stress, which can make people less anxious, more focused and generally happier, more energetic and more productive. It is also possible that relieving stress can allow the body to concentrate on healing itself. Although the Mayo Clinic and most other traditional health care organizations caution that meditation should not be used as a substitute for traditional medicine, they say that it can be an excellent companion to other treatments. You can do meditation within a structured framework by, for example, taking a yoga class or studying the martial art tai chi. Both these include meditation as part of their practice. But you also can learn to meditate on your own. Start by finding a quiet place. Ultimately you want to be able to find that quiet place within yourself, but especially in the beginning, it is good to have an actual quiet place and some time when you know you will not be interrupted. Some people find it helps to turn the lights low and light candles or incense. Sharpen your focus inward. For example, you might think about a place you find relaxing, such as the beach or a forest. Imagine yourself in that place, using all your senses. You also might silently repeat a mantra, or a word or phrase you choose, as a way of focusing yourself. Or you can focus on the moment, being aware of your breathing and what you are feeling while you are meditating. In all these cases, the idea is to let go of the worries and stress of your everyday life and focus on something calming. 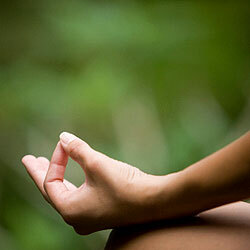 Most people begin meditating by focusing on their breathing. Pay attention to the breath going into and out of your body. Breathe slowly, through your nose, and think about the breath flowing through your body. If your mind starts to wander, re-focus on your breathing. Meditation takes a lot of practice. Experiment with a variety of techniques to quiet your mind and focus your thoughts. For example, some people can meditate as they walk. Other people find that prayer is a form of meditation. Whatever works for you is fine. Try to meditate at least once a day. You might want to start or end your day with meditation, for example. Once you become more adept, you can meditate whenever and wherever you want or need to.